I actually play for the Washington Capitals. Sorry i forgot to tell everyone. 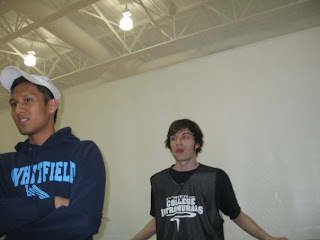 Dont believe me, to the left was my rookie year with Pi Kapp, to the right me with the caps. PS Pie Wins, although Foggy Bottom Cupcake will becoming soon! Today i opened up my Trader Joes (not giving them a shout out at all) apple sauce and began to wonder what was better, pudding, or apple sauce. So i am going to do a full investigation on which one is better! Here is a chart of the Tournament Currently Going on. - Applesauce does past the cinnamon, mocha, and nutmeg test. I has flexibly and its open to new various of the almost perfect treat. - Pudding does not do so well in this category. Try adding Bacon to applesauce, does not work! Very few things can be added to pudding. (unlike yogurt). - Applesauce has a lighter weight to it, making it a far superior item to be eaten with a spoon. Its liquid esc form prevents the item from being stuck on the spoon, a feature most desserts struggle to achieve. - Pudding is a little bit heavier, and typically leaves residue. Its solid base prevents consumers from having an easy clean up. - Applesauce has its limitations, it really only has a total of five flavors, and that is stretching it by adding some color and making it a new flavor. This limitation typically hurts a dessert, because at a independent dinner party ( An Independent dinner party is a party in which all members attempt to be unique not just with their orders but there political views as well). - Pudding - There are easily over 10 different types and flavors of pudding, making it a better party product. - Applesauce is the no brain win on this one. The product is used on Hanukkah as a sauce for latkes topped with cinnamon to give it more flavor. This makes the product a far Superior product than pudding. Overal Winner is ... Applesauce. Applesauce quoted on the Victory " We made it out of the Quaterfinals, but making it out of the Semi Final will be a bit harder. We have two tough competitor(s), either Cookies, which are strong on their easy to bake scale, and Milkshakes which are a better give and go. This is gonna be a tough Round." Ok, so i normally will not post about politics, because that is what most blogs do. Instead, i will compare different styles of politics in a funny manner. Kind of like the one listed below. So listed above is Russia and Georgia, not the state the country. Now i read all of this news about Russia Invading Georgia and getting all this bad press about it. Since Putin is possibly one of the best politicians ever i decided to compare with an American Legend, James K. Polk, for all you Historians, that's the guy that started the Mexican American War. Russia - They Rolled Tanks into a country and issued passports to citizens claiming them to be Russians. What Russia did that really gets them an Advantage was they blamed it on the United States. So Invade a country and blame America... that kinda rocks. Recently i have become addicted to a little treat known as the cupcake. In This first posting, and the real reason the blog was created, i am going to rate different type of cupcakes from different DC area cupcake places. Flavor(s) - Over 24 ( 7 Daily Flavors, and then 17 mixed in ones). I suggest checking there menu online, then deciding which day to go! I do not lie when i say that Hello Cupcake is possible the worst hello cupcake. I think they are made better at Safeway, and even the sketchy one underneath the Watergate, i think this place should be called Goodbye and never see you again cupcake. The whole not having a constant amount of flavors bothered me. There original HC cupcake is probably the worst of them all. So I would rank hello cupcake maybe a 3 bites out of 5! Not good at all. I Honestly think Hello(or Goodbye) Cupcake was better and closer for those in the Business District as well as Foggy Bottom Campus. [PS i am A GW Student, majoring in statistics, history and cupcakes]. I think Cakelove was the original to this cup cake love, but oldest doesn't mean the best. Price- 2.75 for one, 15 1/2 dozen! Flavour(s) Solid 7 a bunch mixed in. AWESOME go try it out for yourself. Most amazing cupcakes ever, a bit if a hike for GW students, but worth the trip. I have yet to try their coffee, but their cupcakes rocks.